German assault detachment wearing full body armour. Somme: British advance east of Gommecourt (until March 5). 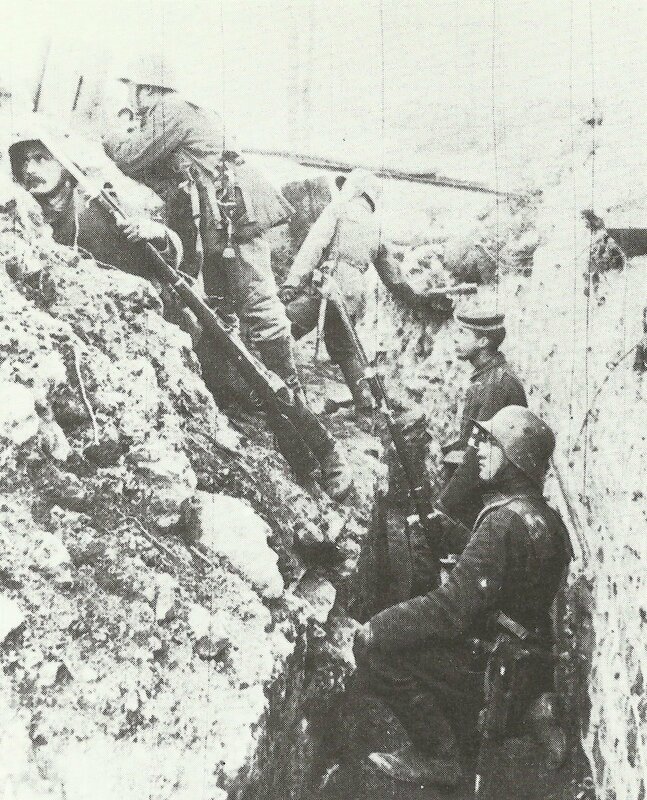 Aisne­: German 51st Reserve Division raid south of Ripont and captures Nivelle’s memo on general offensive from December 16, 1916. Western Russia: Russian gas attacks north of Lake Naroch near Krevo (March 4). guns; 200 MGs and mortars. Arabia: Captain Newcombe and Arabs wreck Hejaz Railway at Dar-el-Hamra Station. During these days Cairo intercepts Djemal Pasha cable to Medina indicating evacuation plan, Lawrence urges Felsal to act. Japan and Mexico: Governments deny receiving Zimmermann proposals. Belgium: Council of Flanders group in Germany (sees Kaiser) to petition independence. USA: Special Preparedness Fund and first Excess Profits Acts passed.